Wall graphics are an excellent way to promote your business, display a special sale or exhibit a fundraising campaign. But these are just a few options of what you can do – your imagination is the only limit to what we can make for you. Let us combine our expertise and knowledge with your creative ideas to create an exceptional product you’ll be proud to display on your wall! We are capable of designing and producing wall graphics which are able to attach to any wall, regardless of its size or texture. Whether you are looking for something to attach to brick, sheetrock, concrete or painted surfaces, we’ve got you covered. We listen to find the right solution for you! Please call 800-622-6333 or contact us online! We take pride in our ability to work with you to produce the best results possible. We use a collaborative approach to ensure that your creative needs are not only met but exceeded. If you already have artwork in mind, we will make sure that it fits and looks good on the wall where you want the wall graphics installed. If you have yet to determine the exact image you are looking for, we offer in-house graphic design services which can take your creative ideas and transform them into beautiful graphics. 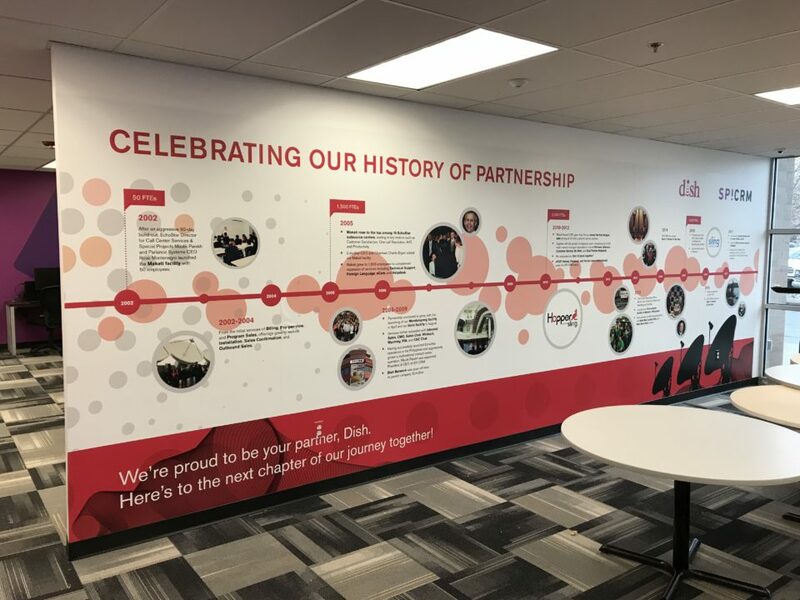 All of our wall graphics are digitally printed on high-quality materials, ensuring that your product will be tough and long-lasting. We offer a wide range of adhesive vinyl with various textures, giving you the freedom to find the material that is best for your project needs and budget. We will custom design your wall graphics to fit your specific wall. Before getting started, we can do a site survey of your wall, checking all sizes and angles to guarantee that your product will fit and look great when installed. Best of all, having no standard sizes gives you the creative liberty to find the perfect solution for your wall without sacrificing quality or design. We also offer permanent or removable installation, allowing you to alter your wall graphics if you so choose. Additionally, all of our installations are performed only through experienced, certified installers. If you are looking for a way to transform your wall, we can make sure it is done in a way that you and your customers will enjoy for years to come!